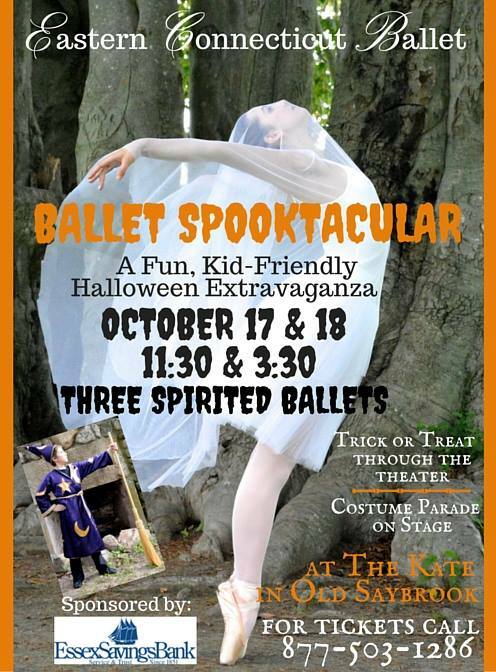 Treat children of all ages to family-friendly Halloween fun with Eastern CT Ballet’s “Ballet Spooktacular”. Special effects and bewitching costumes set the stage for spirited performances of The Sorcerer’s Apprentice, Dancing Bones, and Halloween Waltz. Children are invited to wear their costumes to parade on stage, trick-or-treat throughout the decorated theater and pose for spellbinding photos with the dancers. Performances will take place on Saturday and Sunday, Oct. 17 and 18 at 11:30 am and 3:30 pm. Tickets to Ballet Spooktacular are $18 for adults and $12 for children (age 12 and under) and are available through The Kate box office at 877-503-1286.